I left home around 8:30 with plans to do Petit Jean Montain, then may swing over to Mount Magazine for a two-summit day. The National Forest Roads were good -- much better than they are down in the Oak Mountains west of Little Rock. 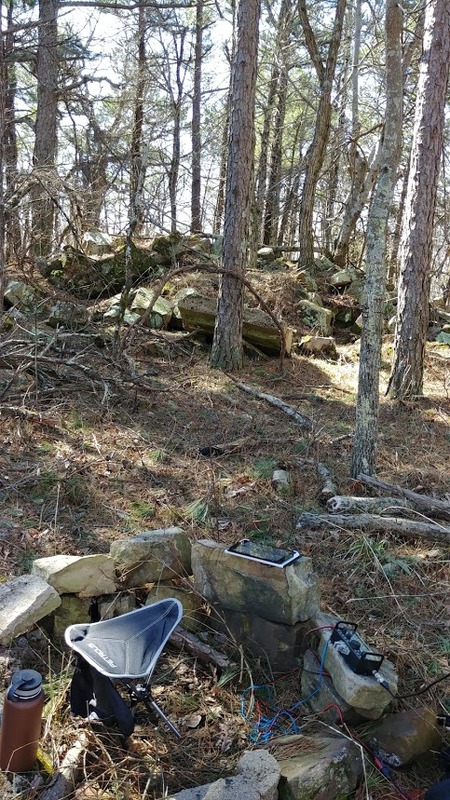 This is probably due to the fact there is a lot of logging in the Oak Mountains, and I saw no evidence of it up in around Petit Jean Mountain. I easily drove to within 3/4-mile of the summit, and the road looked good going up to the top. But I needed the exercise, so I parked at that interesection and hiked the final 3/4 mile in about 20 minutes. As usual, it took me longer to reach the first summit than I had planned and I was up and operating by noon. Bands were good and I made over 30 contacts in an hour. Here is my pickup at the base of the road heading up the summit. 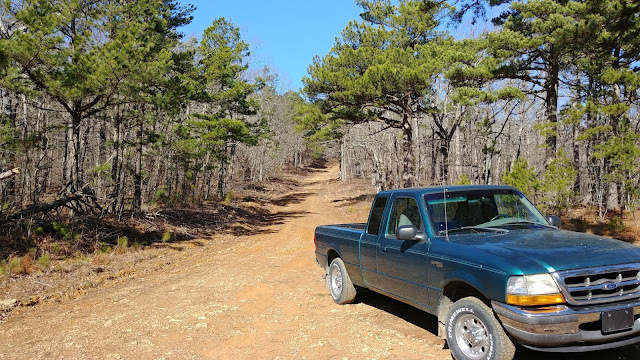 I bought this 1998 Ford Ranger about a year and a half ago just for this purpose -- to get out in the woods and do summits. My two other cars -- Mini Cooper and Mazda MX-5 Miata -- are both great little cars, but not really designed for knocking around on questionable dirt roads. 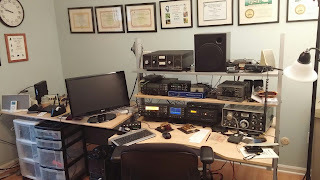 The little pickup is well suited to that and has really expanded my SOTA activity. Operating position at summit of Petit Jean Mountain. 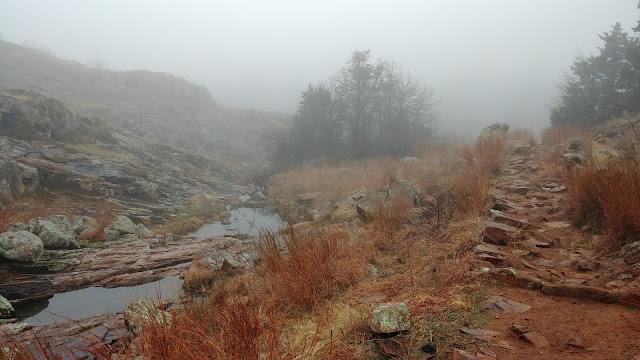 While Petit Jean is one of the taller mountains in the state and sits next to a valley, there is almost no view from the top. Even in February with the leaves off the trees the forest is so thick you can't really see anything. This is typical of Arkansas summits though.